Richmond, British Columbia is the city just south of Vancouver. (If you're flying into the Vancouver International Airport, you're actually arriving in Richmond.) Richmond is a great destination for day trips from Vancouver, especially the historic Steveston Village, which is about 30 minutes (by car) from downtown Vancouver. Steveston is loaded with charm and easy to explore. There are national heritage sites for history buffs, loads of boutiques and artisan shops for shoppers, and plenty of activities for kids, too. You can tour the Gulf of Georgia Cannery National Historic Site museum to learn all about salmon canning and fishing, and see restored heritage boat works at the nearby Britannia Heritage Shipyard. 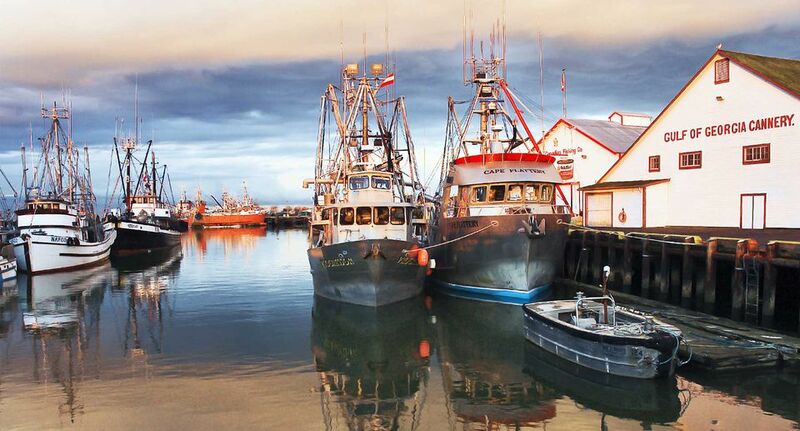 If you're in town for Canada Day on July 1, you must visit the annual Steveston Salmon Festival, a free Canada Day event that includes a parade and Steveston's famous salmon barbecue, where 1200+ pounds of wild salmon filets are grilled over open fire pits. (Yes, you get to eat the salmon.) Of course, you can also find delicious salmon dishes--as well as loads of local seafood--at Steveston restaurants year-round. We love shopping for locally-made wares when we travel. Steveston Village is a wonderful destination for shoppers who want local color and flavor. The shop-lined streets are easy to stroll, and there are plenty of homemade products, including arts, crafts, and local foods. There's also the Steveston Farmers & Artisans Market, which is open on the first and third Sunday of every month, year-round. Are you a fan of ABC's hit TV show, Once Upon a Time? If you are, then you've already seen Steveston Village--it's the real-life setting for Once Upon a Time's fictional town of Storybrooke. In Steveston, you can see the real exteriors used for Storybrooke locations, including Granny's Diner and Mr. Gold's Pawn Shop. For more information on Steveston Village: Steveston Village official website.